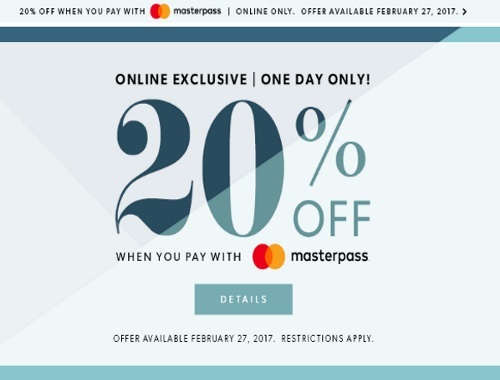 Chapters Indigo is offering 20% off today when you pay using Masterpass! Offer is valid today only, Monday February 27 2017. Some restrictions apply. Excludes eBooks, Apple products and accessories, gift cards, American Girl (except Wellie Wishers), iRewards memberships, and Love of Reading products and donations. Limit: one discount per customer.